Industry leaders are looking at mechanisms to explore newer avenues of revenue, given the disruptive landscape that threatens the very existence of their organisations. They understand they cannot transform their business within their four walls. They must step out to engage with their consumers, offer new services and cannibalise the existing business (if one of a company's products cannibalises the firm’s sales, people buy it instead of any of the company's other products). Competitive advantage is not only determined by the organisation alone or the digital capabilities, but also by partnerships and business models, through which consumers gain maximum value. Therefore, the dream of being “a digital enterprise” needs to include new business models and partnerships. Digital cannot be just another stream of revenue but has to be central to the organisational framework. Digital innovation has disrupted business models that worked well for analogue incumbents for decades. New business models that sell results appeal to customers today far more than those that sell only products. Already, new business models like peer-to-peer networks, freemium, crowdfunding/crowdsourcing, e-commerce/marketplaces and personalisation have been successfully implemented by Uber, Twitch, Tesla, Hired, Clinkle, Beyond Verbal, Vayable, GitHub, WhatsApp, Airbnb, Matternet, Snapchat, Homejoy, Waze, and others. An example of a new business model is Friendsurance, a peer-to-peer insurance that allows spreading risks among friends and relatives. As a result, it is possible to enter into a liability, legal and household insurance at a very low rate. Friendsurance works as a broker between policyholders and existing insurance partners. It lets customers share risks with friends, allowing them to lower prices due to reduced fraud and process costs, and better risk pools. Its business model characteristics include peer-to-peer model, broker model, refunds, and common-money pool. Nowadays, investors are placing a greater value on enterprises with new business models that embrace connected technology, emphasise intangible assets (such as intellectual property), and enable the crowdsourcing of products and services with the use of networks. Despite this, many companies still focus too much on the following equation: Revenue equals price multiplied by volume. Moreover, focusing solely on product, service and process can obscure other, less obvious ways for companies to create value. Leaders should widen the scope of their thinking to analyse how networks, channels and customer engagement can create value. This will help a number of new revenue sources pop up that use digital technology. Consider the insurance industry. Many predict the future is not bright for the sector, as robots take over risky responsibilities and people live longer, thanks to advances in tech and medicines resulting in fewer risks that require coverage. Despite the grim prospects, an insurer can still be a life-coach advisory service to a customer in the future and provide protection based on risk. 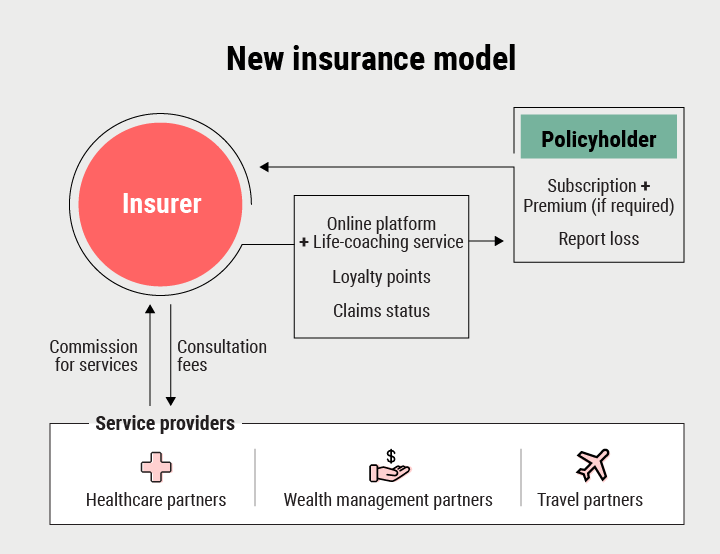 In that case, the insurer can design a new business model: A minimal life-coaching subscription for clients in all areas. Let us understand this from the client’s side and then from the insurer’s perspective. David, who earns above-average income, travels the world for his music shows with his band. He has made investments that may result in huge loss in the future. David’s career was strong for the past three years, with many show organisers chasing his manager for dates but of late the number of calls have decreased and budding artists from his group may form a new band. David is lactose-intolerant. His two daughters need to travel with him often as David lost his wife two years ago. While his daughters (six and eight years) do not mind moving with their dad now, this would change over time. Let us call the insurer DigiEnsure, which goes with the slogan: Let us coach you for life to protect yourself from risks. The insurer is David’s life coach. It can assign a relationship manager to assess his health, financials, family, career, security and other risks. The relationship manager gets a lot of information from connected networks to understand David’s bad investments, career struggles and lifestyle. He suggests that David go for minimal yearly subscription, which will allow him access to all consultants -- financial, health, and others -- all the while offering protection from uncertainties. When David visits a consultant, a commission is duly paid out to the insurer. The appointments for all consultants take place on the insurer’s digital platform. David can enjoy premium services by enrolling for the Gold package, which offers life-coaching services for the family and not just himself. David can also use some of the loyalty points accumulated over the year to upgrade to the best nanny agency for his daughters. For risks that may still prevail, David can pay a low premium for coverage. The coverage is instantly provided for travel, health, and new home, as David’s information is available on the insurer’s network. The insurer, through its partner network, got David a new public relations agency and a manager who helps him crowdsource local talent to start his online studio, allowing him to travel less for concerts. In this new business model, the insurer’s key associates would be wealth managers, healthcare providers, travel partners, wellness partners, grocery partners, agencies (security, public relations, talent, nanny), payment provider, insurance partners for types of covers that DigiEnsure does not deal in, and lifestyle partners. For DigiEnsure, the key activities would be digital platform development, defining partnerships with service providers, research, and brand development. Under the model, key resources would be digital platform, data, and technology infrastructure. Moreover, there would be self-service on the platform, relationship managers or agents, and 24x7 customer support. The insurer would target mature markets, 35-55 age group, and people earning average income. For publicity, the insurer would depend on word of mouth, social media, and lifestyle digital properties. Costs incurred by the firm would be on platform development and maintenance as well as marketing. And revenue would come from subscriptions (three-year, five-year on silver, gold and platinum packages), commission per visit, and insurance premiums. The new business model requires leaders to steadily define partnership contracts, revenue models, and implement digital enterprise tech. Only then can the disruptive model be a success. 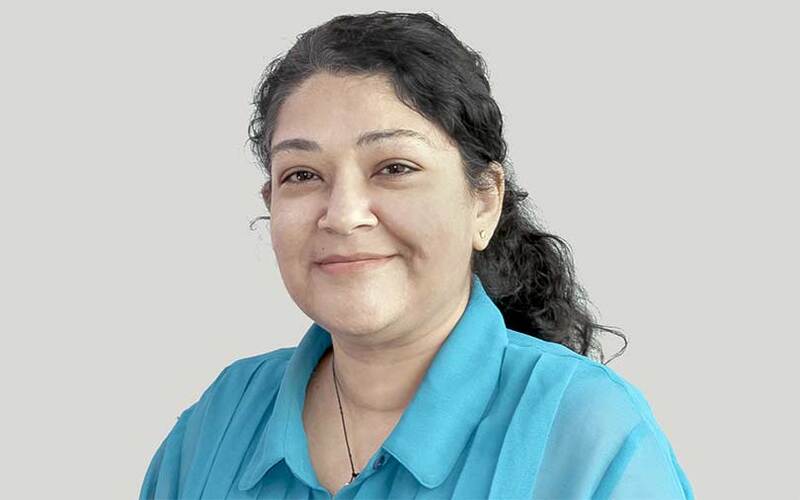 Yogita Khaitan is director for programme management at digital marketing company SapientRazorfish. Views are personal.